The Old Truman Brewery, Shoreditch, London – The 2016 PC Gamer Weekender is in full-swing. Friendly neckbeards wander the floor with Wargaming.net swag-bags. A Warhammer 40K spider unit bursts through the wall in a shower of painted card and Styrofoam. Downstairs, grey-clad early birds don HTC Vive headsets to bumble around a virtual reality playpen, confirming VR’s place beside long-time champion the Wiimote as the new Flailing, Failing and Looking Generally Uncomfortable while Gaming accessory. 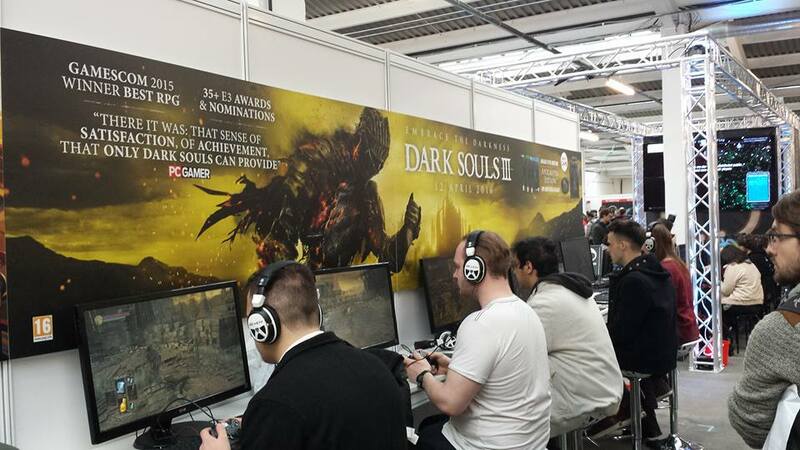 In the centre of the gaming floor stands ten stations playing FromSoftware’s Dark Souls 3. The line snakes around the booth, a mix of newcomers to the franchise, Dark Souls die-hards and straight-up sadists. The Souls series, Bloodborne included, has a reputation for its gruelling difficulty and old school sensibilities. No handholding, no waypoints, no mercy. It is also an engrossing and enigmatic RPG that has earned the devotion of millions of gamers around the world through beautiful world-building and lore, brutally addictive multiplayer and deep, satisfying combat mechanics. It’s these combat mechanics that lie at twisted heart of Dark Souls. The games handle other elements – RPG-style character levelling, weapon upgrading, exploration – but these exist in service of the moment-to-moment gameplay; visceral skirmishes, resource management and, most notably, death. In Dark Souls, death is a core mechanic and a necessity for honing your skills against the game’s considerable challenge. There’s only one way to learn those enemy attack patterns, discover those shortcuts and exploit those boss weaknesses, and that’s blood, sweat and countless restarts at your nearest bonfire. Like the damned hollows of Lordran, husks of humanity lost, It’s the curse of the established franchise to go casual. With more sales comes pressure to cater to larger audiences, which is usually shorthand for making the experience more streamlined, more accessible and, worst of all in Dark Souls’ case, easier. 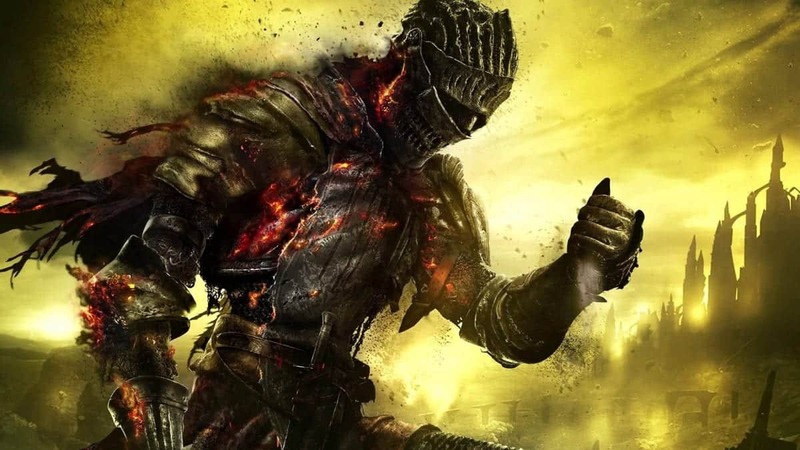 But FromSoftware and series creator Hidetaka Miyazaki (who is heading up the third instalment) have a good grasp on what makes the Souls series so popular. Stepping out onto the parapets of the High Walls of Lothric, there is a palpable sense of scale and intrigue. Undead archers prowl stony outcrops, hollows groan and kneel in prayer, and Balder Knights stand fearsome and gleaming in the sun. That old feeling of trepidation is there, and the discovery of new enemy types, such as a larger, axe-wielding skele-warrior and a shrieking, cloaked undead are encounters to be met with caution and thrilling aggression. Anyone who has played Dark Souls’ spiritual sibling Bloodborne will feel decidedly safe with a shield in their left hand and a healing Estus in their inventory. Bloodborne’s savage combat, which rewards aggression and risk-taking, was a change of pace from Dark Soul’s ‘turtle’ gameplay, which puts greater emphasis on shield defence and the use of ranged attacks. Dark Souls 3 strikes a happy medium. Movement is noticeably faster and more deliberate, and the enemies feel deadlier and more driven to cause you harm. Even lower-level enemies like dogs are faster with more variety in their attacks, adding unpredictability to their behaviour. This opens up two broad strategic routes: return to the defensive shield-based gameplay of older iterations, or exploit the frantic enemies with your own aggressive tactics. Bloodborne’s quickstep mechanic is missing but dodge rolls feel fluid and imperative as ever for avoiding falling axes and swinging swords. The jumping controls, always a little fiddly, have been mapped to the right analog stick a la DS2. Parries and backstabs are satisfying to land given the right timing and positioning, aided by the reworked sound design which gives the moment you crunch your blade into the back of an undead a boom and reverberation akin to the crashing of Executioner Smough’s hammer, which we thoroughly approve of. The audio in general is more vivid. The clink-clank of armoured footsteps and the glug of an Estus flask feel familiar, but the grind of axe on shield and the unhinged burbles of your enemy are punchier and more immediate. Dark Souls 3 has an urgency that DS1 and 2 lacked; an anxious dread to replace the steady oppression of its predecessors. If you’re a scrub, Dark Souls 3 is waiting to pummel you into the dirt, gladly and repeatedly. If you’re familiar with the other games in the series it will probably destroy you, too. Lothric may look more inviting than Lordran or Drangleic but there is still danger at every turn. Stamina management is key, and rushing into groups of enemies will see you stun-locked and slaughtered in no time. Dangers lurk in the shadows and corridors, but even out in the open surprise death can strike, such as from the familiar fire-breathing dragon, ready to turn your still-pretty-unsafe path into an alley of crispy doom. The boss of this area meanwhile, the twin-bladed Dancer of the Boreal Valley, is an unpredictable whirling figure of death. Boss encounters form a major focus of the game, and working out strategies and patterns for their defeat will likely remain one of the most gratifying areas of gameplay. As the floor catches the flame of her blades during another rangy spin attack, landing just inside your invincibility frames from a well-timed dodge roll, it’s easy to feel the addictive rush that the best Dark Souls’ boss battles deliver. Next PostHow do you find the right technology consultancy to help your business?